Central Boiler furnaces can provide 100% of your heating needs. 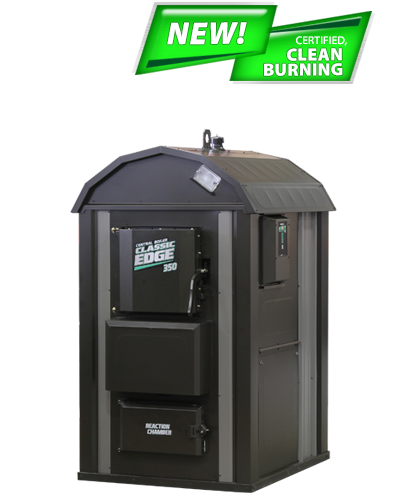 Central Boiler manufactures and distributes the Classic EDGE Outdoor Wood Furnaces, which are outdoor wood-fired hydronic heaters that heat multiple buildings, hot tubs, pools, greenhouses, domestic water and more. Central Boiler's Classic Edge is the perfect combination of value and performance with the same quality, construction and performance as other Central Boiler models. The Classic Edge is easy to operate and maintain. Models to match many installation scenarios are available. •Value AND performance - the revolutionary new patent-pending design of the Classic Edge combines value and performance without sacrificing Central Boiler quality, reliability and performance. •Up to 50% less wood - compared to traditional and some other methods of wood heating. •Easy to operate - FireStar II controller takes the guesswork out of operating. •Easy to maintain - firebox design and heat exchanger system make for easy maintenance and cleaning. •U.S. EPA Certified - Classic Edge 350, 550 and 750 are U.S. EPA Certified. Here at Clover Hill we work to provide our boiler customers with what they need before and after the sale. 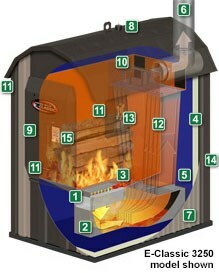 We have been offering Central Boiler outdoor wood furnaces since 1995. Give us a call or stop in and and we can walk you through the process of sizing and answer all of your questions. We stock most parts, replacement parts and maintenance items for all the hydronic heating supplies we carry. For more information and specifics about Central Boiler outdoor wood furnaces and what they can do for you, click on the logo at the top or give us a call. 2.Value and Performance - Classic Edge models are the perfect combination of value and performance, with the same quality, construction and performance as other Central Boiler models. 4.Insulated Chimney - Two 4-foot all stainless steel insulated chimney sections are standard. 6.Vent Cap - Design eliminates evaporation. 7.Large, Solid Cam Latch Firebox Door. 8.Removable Air Channels - For easy cleaning and maintenance. 9.Vertical Heat Exchanger - The vertical design of the heat exchanger minimizes the amount of maintenance. 11.U.S. EPA Certified - The Classic Edge 350 and 550 are U.S. EPA Certified.